The trial of ousted Islamist President Mohamed Morsi started Sunday on the grounds of leaking classified documents to Qatar, in the fourth case against the toppled leader. The court adjourned the case, in which 10 other defendants stand trial, to 28 February. The prosecution charged Morsi and the head of his office, Ahmed Abdel-Aati, with leaking secret information on general and military intelligence, the armed forces, its armament and other state's policy secrets to harm the country's vital institutions and state security. The two used their positions to pass the files from the presidency offices to Amin El-Serafy, a presidential secretary, who then passed the documents to his daughter Karima. Karima then handed the documents to parties of individuals that orchestrated a final delivery operation to the Qataris. The rest of the defendants, who include Ahmed Afify, a documentary producer; Mohamed Kilany, a flight attendant; Ahmed Ismaiel, a teaching assistant; along with Khaled Radwan and Asmaa el-Khatib- two journalists at pro-Brotherhood TV channels - are charged with turning over the copies of the classified documents to two individuals on the staff of the Qatari-based Al-Jazeera, and an unknown Qatari intelligence officer. Three of the defendants are tried in absentia. Some of the defendants allegedly asked for a million dollars from the Al-Jazeera editor and the Qatari officer, in return for the information which they gave them along with an offer of more money. Other charges include leading and joining an outlawed group- the Brotherhood- which aims at changing the regime with force, attacking army and police posts and public property. 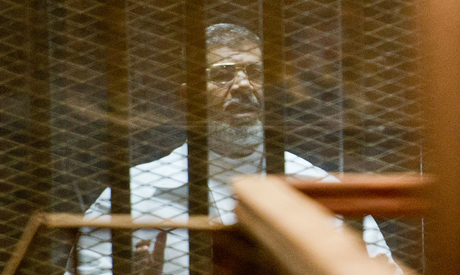 Morsi faces three other trials on charges of espionage, escaping from prisons during the country's 2011 revolution and inciting his supporters to kill protesters opposed to his rule during his time in office. A security crackdown on Morsi, the Brotherhood, and their supporters have left thousands in jail and facing trials on a variety of charges. Hundreds of Islamists were handed initial death sentences last year that are currently being appealed. Egyptian and Qatari relations were strained after Morsi's ouster and the rich Gulf nation's hosting and support to fleeing Brotherhood members. The two countries experienced a recent thaw in relations as a result of a Saudi-sponsored initiative. Al-Jazeera Mubashir Misr, the Egyptian affiliate of the Doha-based network, recently closed its offices and halted its broadcast, which is one of the reasons that relations between the two countries have started to improve. is this the first free elected leader of egypt? than a 7th century country! .. THANKS GOD WE HAVE THE MILITARY ..TO PROTECT OUR GREAT NATION FROM THE LONG BEARDED LUNATICS USING RELIGION AS A WEAPON OF MASS DESTRUCTION AGAINST THEIR OWN PEOPLE AND COUNTRY....TRAITORS..TRAITORS..AND ZEBIBA THUGS.. I do not understand what you are talking aout. Use active verbs and short sentences. Interesting question: can a president decide what information to share? Seems that in Egypt the final judge of that is the military.